As of yesterday, my best friend Terri and I finished one year of doing SOAP Bible studies in which we read Scripture, wrote in journals, and texted one another each and every day. We began doing SOAP studies on June 5, 2017 at the completion of our annual summer beach trip. We both wanted to get into a Bible studying habit and when I heard Louie Giglio speak about a SOAP Study on a Passion City Church podcast, I was intrigued. So, we looked into that study, the book of Mark, and decided to go for it. That study began a year long SOAP study experience that eventually took us through each of the Gospels of the New Testament as well as James, Acts, Romans, and 1 Corinthians in their entirety. We also did an Advent based study over the Advent season and for the last few months we have gone through three studies about Faith, Peace and Prayer. We even added daily Scripture writing to our SOAP studies as we got into the Peace and Prayer sessions. I have to say, it’s been one incredible year! And, I want to talk about that, but…first I want to say a few other things just to give a clarity as to why I’m posting about all of this. It’s sort of a tricky thing, I think, to write about something as personal as Bible studies and that because I don’t want to come across like I’m ever bragging. 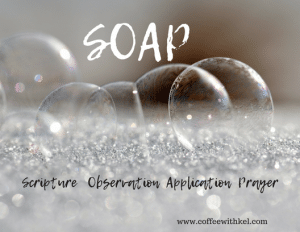 So, I just wanted to say right here close to the beginning of this post that celebrating a year of SOAP Study has zero to do with celebrating OUR accomplishment in that, but celebrating what God has done and continues to do via His Living Word. I’m sure Terri can attest that along the way in this year there were days when we were ON FIRE for this thing and just really sailing into it like a bird on the wind. Similarly, there have been times when we felt pressed or maybe didn’t feel “into it” on some days and the like. 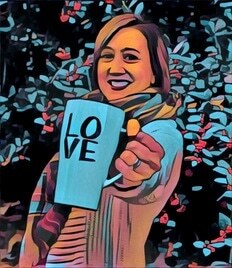 Just keeping it real, some days I went into it with a light and happy heart, fully prepared and sometimes it wasn’t always something I dove anxiously into every day. (I venture to say she didn’t either.) But, that’s another way the beauty of Scripture shines through is that God’s word never returns void (Isaiah 55:11) and we both learned and gleaned so much from these studies even on the days when it wasn’t the easiest. I never cease to be amazed at how God works in how He placed lessons before us throughout this year that were SO relevant to times and circumstances each of us were facing. It was like He said “HERE…KELLY! READ THIS! Soak this up, I’m speaking to you, girl!” Seriously…blows me away in all the best ways. God is just so amazing to me and the way His Word is living and relevant is just truly outstanding. I want THAT to be the focus here. I want it to be about Him. Because, He’s more than worth that honor. So, exactly what IS a SOAP Study…? The way Terri and I did this was to journal our daily SOAP (and, like I said, we added Scripture passage writing the last few months) and then we would text our daily journal entries to one another. By sharing, we were able to have accountability daily AND we were able to get each other’s insights. Some days we would come up with some of the same things, other days we would be able to learn and expand our understanding from the other’s point of view. We didn’t have a set time to do this each day, but we always texted each other when we were done for the day. Each of us wound up taking our Bibles and journals with us on trips, sent them sometimes very early or very late in the day depending on the daily schedule, etc. But, each and every day we sent them and it quickly became something I know we both looked forward to as part of our days. I knew if I went to bed before I got her SOAP text, I would have that to look forward to first thing the next morning, for instance. The way this became a part of each of our daily routines was anything BUT “routine” and everything extraordinary in how it added countless blessings to our lives. Yes, even on the days when we didn’t feel good or were tired or stressed or what have you…life took a back seat to the bounty that God always offers us via His Living Word. If you want to get into studying God’s Word, I would HIGHLY recommend a SOAP study. For the first session, as I mentioned, we used Passion City Church’s guide for the Book of Mark. Going forward from there, we would Google and find daily studies for for the Gospels and other books of the Bible or daily studies by theme. We were able to easily apply the SOAP method to those and it kept us in a great structure. We added Scripture writing in March of this year and while that added a touch more time to each day’s study time, it also enhanced the learning for me because there is just something about writing that really connects me with what is said. I also recommend doing this with a study partner and friend. Terri and I both found that there were times when the Scripture reading each day seemed to really hone in on things that were relevant to each of us. I dare say that neither of us has EVER had a hand-written journal experience that lasted very long at all, but each of us filled up more than one journal in the course of this year. Again, something about writing is therapeutic AND helps to commit things to memory. We also agreed that being in the Word daily just helps in a multitude of ways. It was also amazing to me to read each other’s daily insights. Many times our thoughts and observations aligned, but sometimes we both got a new insight from the other. This year doing SOAP drew us both closer to God, gave us a better understanding and knowledge of Scripture, reassured and challenged us, strengthened our already close friendship and SO much more. That’s just like God, isn’t it? You can’t even begin to fully name all the blessings He provides. Same with this study. What we both gleaned from this year of SOAP studying is more than I could even begin to fully list. I have to say – my cup runs over, y’all. Truly. Now that we have done a year of SOAP’ing, we have decided to change tracks a little bit, but still keep in The Word and texting one another daily. So…what’s next? 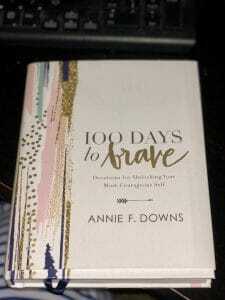 We will be diving into Annie Downs’ book 100 Days to Brave starting today. I am SUPER excited to get started on this one and hope to be able to share more with y’all later down the road. I got to hear Annie speak a few months ago at Mt Bethel UMC at a women’s worship event and she legit blew my socks off. So, yea…I can’t wait to dive into this book and see what God has in store for Terri and me as we venture into bravery these next 100 days! If you have any questions about SOAP studies, please feel free to contact me. I’m far from an expert, but I’m happy to give some recommendations, encouragement, etc. This past year of being in the Word, journal writing and sharing with my best friend every single day has made such an impact for good on my life. I’m thankful…encouraged…hopeful…uplifted…and MORE. God is so good and I really do look forward to seeing what is next in the 100 Day journey in front of us. First – an admission that I am NOT a Valentine’s Day person. To me, it’s a day on the calendar where flowers are overpriced, restaurants are crowded, and it can be isolating and sad for some people. Besides, shouldn’t we show love daily to those we love the most? Yes. I know that’s a given. And, I’m not against what other people want to do for this day because — to each their own. We do a little bit for our girls, but we really don’t go overboard. In fact, I’ve told Mickey to NOT send me flowers and all on this day. Sometimes he does anyway, but it’s mostly just another day around our house. That said, today does bring an opportunity to reflect on what love is and what love does. 1 Corinthians 13:4-7 (although this graphic shows 6) says so much about what love is and how love should look. Mickey used this passage in his proposal and for that, and a lot of other reasons, it means so much to me. It’s a great reminder for every day on how to love well. We don’t need flowers, candies or baubles to put this into action. I won’t try to add to what this passage has to share with us because nothing I can say will mean more than what it already says. Not to mention that whole not adding to Scripture thing. What I will say is that those of us who are married or in a committed relationship can always glean from this and make sure we’re living it out and putting it into practice. And, for those who are in a season of waiting – well, this is the most excellent guide for that one special someone when they come along in your life. Want a litmus test for a lasting relationship? Open The Word, it’s there in 1 Corinthians. This blog title may be sort of ridiculous in some ways because, those of us who are believers know for a stone cold fact that God has always got our number. I mean, He knew us before we were born and there isn’t another that knows us more intrinsically than our Creator. So, yea — there’s that. But, what I mean here is there are just moments when you KNOW that He’s up to something with YOU and He’s got your number. Have you ever sat in a sermon and just felt like it was aimed right at you? That was me today at our church. There are many times when a sermon reaches me, of course, but today, especially toward the end, I sat there feeling like it was AIMED at me. Like — listen up, girl…this is for YOU! And, I don’t even mean that in some selfish “this is MY sermon, back off, people” way, naturally. I just felt it so personally. And, the more I think on it, the more I see my own lessons to be taken and applied to my life. We are in a sermon series entitled “detox” right now and I’m sure that’s a common theme in churches all over the place. I know that we are in this series with other churches in Alabama, for instance. Today’s sermon, basically, was about detoxing from the world. Pastor Ike talked about starving things of the flesh (doubt, negativity and sin) to feed the spirit. In order to starve doubt out of your life, trust God (Proverbs 3:5). In order to starve negativity from your life, focus on thinking what God thinks (Isaiah 26:3). And, in order to starve sin from your life, turn to what God wants (Ephesians 4:29). He went on to say that we also need to feed habits that encourage us spiritually. Those are – being in God’s Word, worship and prayer. As a church, we were invited into a 21 day prayer event, starting today. And, we were given a “challenge”, for lack of a better word, to focus on these next six days in doing the things that feed our spiritual habits — Bible, worship and praying. I’m thinking – cool, this is right in line with what I wanted to do for this year…this is awesome…I’m in and I’m ready! Let’s do this. Then, Pastor Ike basically talks RIGHT to me and he focuses in on the worship time for a little bit. He says that this week, only listen to worship music when you listen to music. Y’all, I have some serious radio ADD and I don’t stay on one station for long at all. Ask Mickey. It bugs the mess out of him. And, I enjoy listening to sports talk radio besides just music. So, I’m thinking okay, I can do podcasts of sermons and I can do worship music and I can still listen to my sports talk. WRONG. Pastor Ike went and called out VERY SPECIFICALLY, mind you, sports talk radio. Oh no, he didn’t…except…OH YES, HE DID! And, to be just honest, I was thinking “Awww man! It’s the week after Georgia just barely won in a bowl game AND the week before the college football championship. And, no sports talk radio?!?! Are you kidding me right now? !” Yea. I did. BUT, that’s when I felt like it was aimed at me. If anything is keeping me from worship or the word or encouraging relationships, well…that needs a break. So, no sports talk radio for this girl this week. (And, no other music either.) I messaged my friend Melissa about all this and she said “Oh my stars!!!! Jesus is ON to you!!!! !” Yep. That’s the moment when you know – He’s got your number. What I needed was for something I wanted to do to be taken away so I could focus on what I need to do. And, she went on to remind me that all He’s asking is for me to listen. (Shout out of thanks to my sweet friend. I needed that!) So, that’s what I plan to do. Listen. Listen for that still small voice – the one always tells me the truth. Without switching channels 57 times or whatever, just listening. And, I also plan to use any non-radio time to connect with family and friends on the phone which goes back to that whole being intentional thing and connecting with loved ones on a more personal basis. This is a whole ‘nother blog post in the making, but I really need to use my smart PHONE for more than a tech device. For now, I digress. So, this week I will do my best to be more in The Word, to worship and to pray very intentionally. This is the start of 21 days of prayer. I’m in. And, I just want to hear and follow what He has to reveal to me in this time. One page of today’s sermon notes. From me and my family to you and your’s…MERRY CHRISTMAS! !